Sure, the amount of native storage on your iPhone has risen sharply over the years. According to a report from Sensor Tower, the minimum storage available on an iPhone has doubled from the 16GB on 2013's Apple iPhone 5s to the 32GB on last year's Apple iPhone 7. But the truth is that Apple is not keeping up with the huge increase in the file size increases on popular apps. This is why many users of the iPhone are often looking for apps to remove in order to create space for new downloads. Here is an amazing piece of data that says it all. The top ten most downloaded iPhone apps in the U.S. required just 164MB of space to install in May 2013. Last month, the top ten most popular stateside iPhone apps required a stunning 1.9GB of space to install. That means the storage required to install these ten rose 12-fold in just four years. A big push toward increasing the sizes of third party apps came in 2015. That is when Apple doubled the maximum app cap size from 2GB to 4GB. The limit is based on the initial download size of an app. 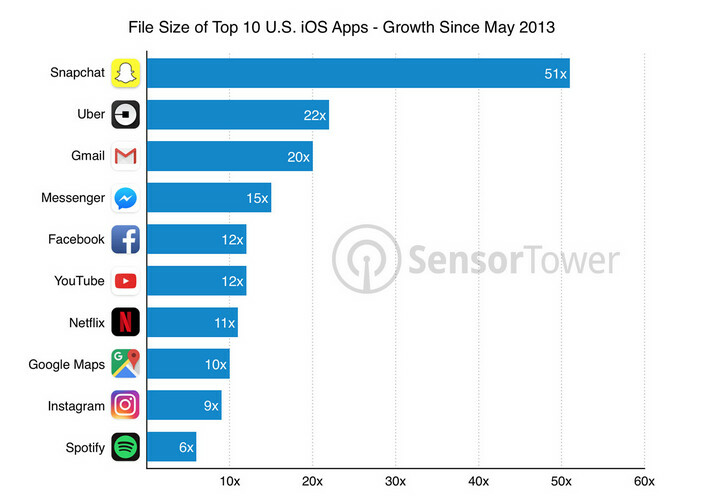 Among the top ten most popular iOS apps in the U.S., Snapchat has had the largest increase in file size since 2013, growing an amazing 5100%. Uber is next, rising 22 fold over four years. Even the smallest increase over the last four years, which belonged to music streamer Spotify, resulted in a 600% increase in file size. Games also have the same problem. Candy Crush Saga now takes up 223MB of storage, up from 48MB. That is an increase of 460% since 2013. To help with this issue, iOS 11 will send out recommendations to users suggesting that rarely used apps be offloaded. This would remove a core app while keeping data and settings in case you want to quickly load the app again. The next iPhone should have double the memory, besides everyone should already know to get the 128 or the 256gb version. But also offers 128gb for the previous price of the 64gb and 256gb for the previous price of 128gb. All the above apps aren't made by Apple. They should compare apps made by Apple to see if it's just lazy programming from 3rd party developers. Are you being sarcastic? Does apple make any of those apps? He is asking if Apple uses a better compression algorithm than the rest of the developers. Like what if Apple made Snapchat, would the app be smaller and have the same features due to Apple's developers being better at coding for iOS. What he wants to know will never be answered of course, unless Apple buys one of the apps mentioned in this article. Compression algorithm? The hell are you talking about? There is no compression of anything after an install, it's all up to the file system. Apple apps have increased just as much in size if not more, just check the iOS install size. When writing code for an app one uses a compression algorithm, the developers would have already done that for you well before you install because there would be no app without compressing the code into one file. I can't speak for all the apps, but Facebook, Snapchat, Instagram have all become much larger due to a ton of new features being added. Not simply lazy programming. Apple should take actions to compress the app installation size or they should give more storage in their phones. Either way wastage of storage is unacceptable thus all of them need to optimize their apps really well. You can compress apps all day but with all the features app makers are doing almost every month, the best solution is still increasing the user's storage. iphone is a pricey device so I think it's fair for apple customers to have 128gb as base storage and ditch 32 and 64gb forever. Or maybe since tney can afford it, tbey could be a trend setter and offer 128GB minimum, have 256GB as mid and 512gb as too. They can afford it. The iPhone 7s is likely gonna cost them even less to make after using the same design a 4th time. Samsung at leasts give 64GB. Which is great because we can use sdcards. But im not a hypocrite. Samsung can also give the same 3 options. But, they do offer sdcard option, and i can buy 128 kr 256 for far less than what Apple is gonna charge for it. The difference between greed and substance. Yet you guys flock to Apple like sheep to its Shepard. And people laugh and think I am crazy whenever I say that I am wanting a 1tb phone. But at least, with most Android phones, storage is extensible via SD card, so the increase in apps size is less of a problem. You forget that since Android 4.x you can't install apps on "external storage". Some manufacturers have a workaround like fusion storage (archos) or can move part of apps to SDcard (e.g. samsung). And recently google themselves have introduced Adoptable storage (similar to what archos did) but most manufacturers disable or hide this. So basically you can only store media on it. Which is better than nothing ofcourse. With carriers going to unlimited data, at least these apps will be quick to install with 5G speeds coming to all "premium" devices, right? Yeah in 2019 when the first 5G network rolls out. Is this actually a surprise to anyone? It mirrors exactly what happened with PCs. Back in the days when you had megabytes of storage and kilobytes of RAM, programs were smaller. As your resources grow, the program's become more complex and take up more space. It's a natural progression. just because they have more resources, doesn't mean they have to bloat the programs. Why do we need all that snapchat functionality in fb messenger? The awesomeness of Android. Deop in an SDCard and ypu can move the apps data to it. The awesomeness of a education and proof reading.